Atlantis is one of the most extravagant and luxurious resorts in the island nation of the Bahamas. The resort is situated on glamorous Paradise Island, a section of land that sits just beside the Bahamian capital of Nassau. Paradise Island is known for its tropical environment and glamorous character. It is definitely a prime tourist hub that attracts holidaymakers from all over the world. Taking a big portion of the island is the Atlantis Resort complex that features modern amenities and state-of-the art attractions. The resort’s main hotel area is a striking salmon-pink building that tries to recreate the look of the mythical city it was named after. But you don’t come to Atlantis to find a just comfortable bed to sleep. This splashy resort offers its guests superb entertainment and recreation opportunities as well as superior accommodation. One of the main attractions to experience here is the Atlantis Waterscape; an open-air aquarium that spans 14 acres, making it the biggest of its kind in the world. Visiting Atlantis Waterscape gives you the opportunity to admire up close the 100 species of colorful fish that call the aquarium home. Reserving a room at Atlantis Paradise Island Resort automatically gives you free access to the Aquaventure site. This incredible waterscape is equipped with over 20 pools, exhilarating water slide and a Lazy River Ride, which stretches for a mile! The fantasy sea-themed Aquaventure also has an impressive selection of shops, restaurants and entertainment facilities. At Atlantis’ Dolphin Cay, you can grab the opportunity to swim with friendly dolphins and play with sea lions. You can also opt to join their trainer-for-a-day program and get to know the inner workings of the facility’s rehabilitation sites and programs. Atlantis is definitely the perfect destination for visiting families as it has something for folks of all ages. The resort’s kid’s club called Atlantis Kids Adventures & Camps caters to guests between the ages of 3-15. The club regularly organizes varied supervised expeditions, interactive games and activities for participants, making their experience in Atlantis quite memorable. Guests in their teen years will be thrilled to spend time in the nightclub called Rush. This special club is equipped with gaming rooms, an internet lounge, a café and a dancing area adorned with video walls. Looking to practice your swing while overlooking the spectacular ocean? If the answer is yes, then you will be happy to know that Atlantis Paradise Island also has a beautiful, world-class golf course. In fact, the Ocean Club Golf Course is often recognized as one of the top resort courses in North America and the Caribbean. Ocean Club’s more than 7000 yards of alternating fairways, seaside green space and tee settings are all meticulously designed to give the players an unforgettable golfing experience. If you want some serious adult fun, test your luck at the Atlantis Casino, which is dramatically set on a seven-acre lagoon. This casino is not just a sleek and modern place to gamble and have fun; but its innovative architectural design is definitely worth seeing. At Atlantis, you also have the opportunity to pamper your body at the Mandara Spa and stay fit even on holidays by spending time at the resort’s fitness center. 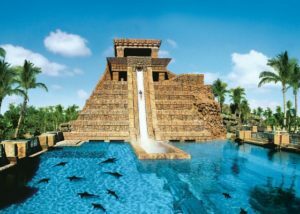 Add in the gorgeous beaches and you have the the perfect destination for a very satisfying vacation at an almost fantasy location – Atlantis at Paradise Island! For a Travel Reference map of the Bahamas, go Here.